I've showed you my clothing winter sales haul and here is the most exciting part : the makeup ! I have chosen to show you only the ranges I have chosen so that you know the products that I have and you may ask that I write a review of one product sooner than another ! How cool is that ? Marionnaud is one of the first stores I've been to at the beginning of the sales. 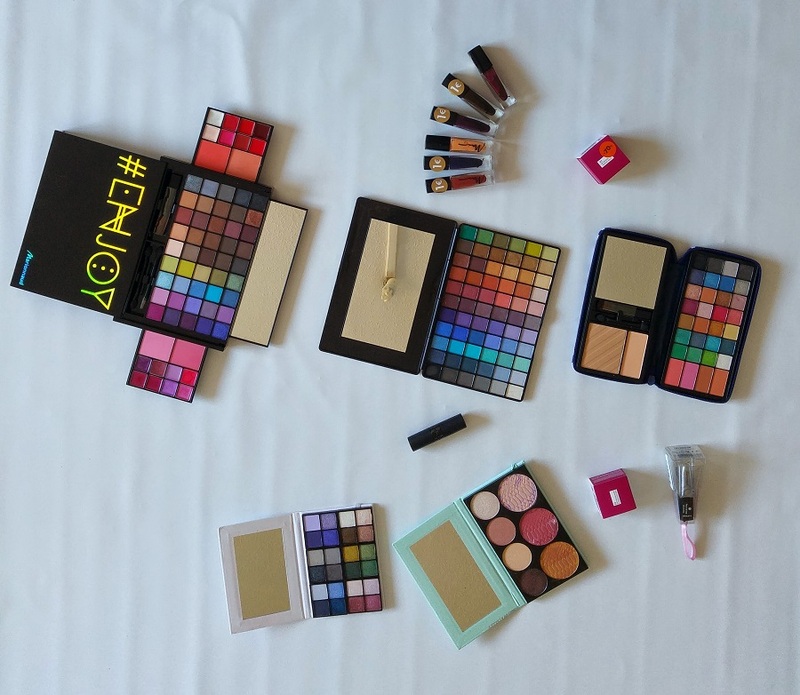 I've been there 2 or 3 times and I have had so much fun with their palettes ! I have already reviewed their Color Booklet eyeshadow palette, the Our love is unique palette they released for Valentine's Day and the Color Booklet blush & eyeshadow palette you can try to win until February 29th at noon GMT+1 right here ! You can also see what I think of the wonderful Gosh Velvet Touch Lipstick in Sweetheart that they had in sale for less than €7 ! I have also bought 2 large #Enjoy palettes : one contains but eyeshadows and the other has eyeshadows, blushes and lipsticks inside. Then I have bought two Ombres soyeuses (mix of a cream and powder eyeshadow) for less than €4 when they retailed at €12 or €13, six Marionnaud nail polishes for €1 and one last silver Marionnaud nail polish for €1.50. 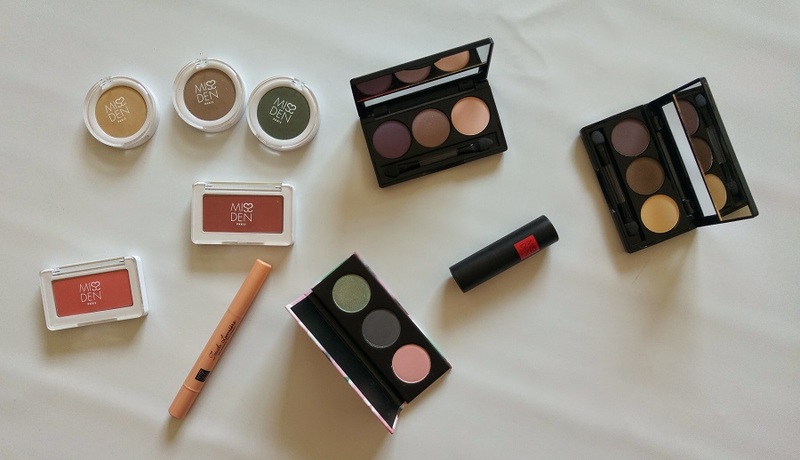 I had a lot of fun choosing products at Marionnaud, I love the quality of their makeup and that's one of the stores that I was not disappointed in during the sales. I have also bought makeup products from the brand Miss Den that you can buy at Leclerc, Géant Casino or Monoprix (French supermarkets). First I only bought a lipstick for €3 and I went back to buy some more but they had none left ! So when the whole brand was -70% off, I bought 3 eyeshadows, 3 eyeshadow palettes, a highlighter/concealer, two blushes and a brown mascara I have just forgotten to photograph. I expect I'll buy reviewing this brand before long but I am already in love with the lipstick. I have bought just two plain black mascaras at Yves Rocher. I did want to buy the brown one but they had none left in stock, that explains why I have two because I really loved it ! I was really disappointed in Sephora this year. Well, I have to say that I'm disappointed every year. I have only bought one Velvet Eyeshadow in Plum Velour. I have also bought two Bourjois Color Edition 24H at Beauty Success for about €3.50 each when they retail for about €12 each. I wasn't sure of the quality so I bought just two colors I was sure to wear : a golden/white one and a khaki one. 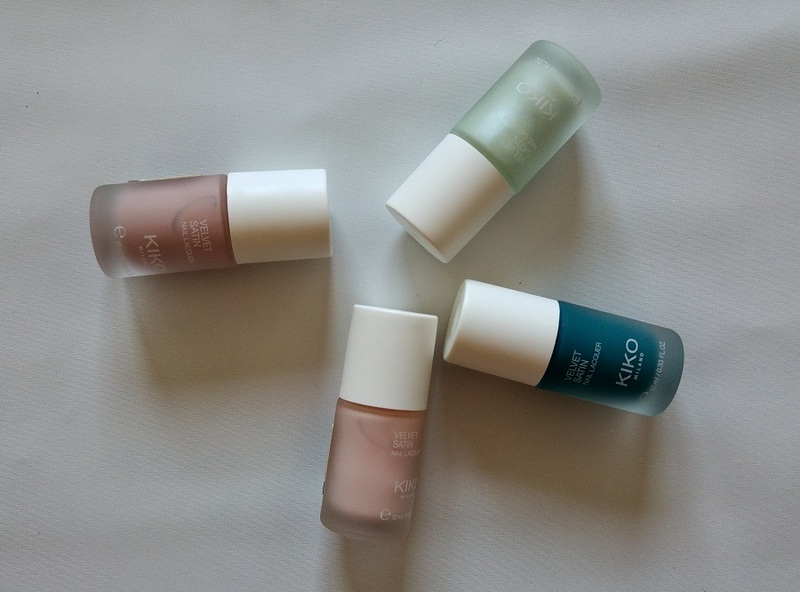 I have been crazy this year with Kiko Makeup ! 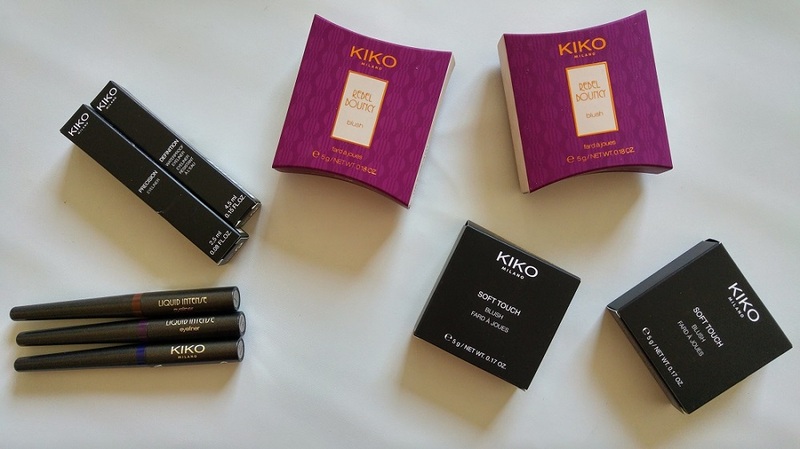 I had never tried but just one eyeshadow from Kiko and so I bought all kinds of things there. 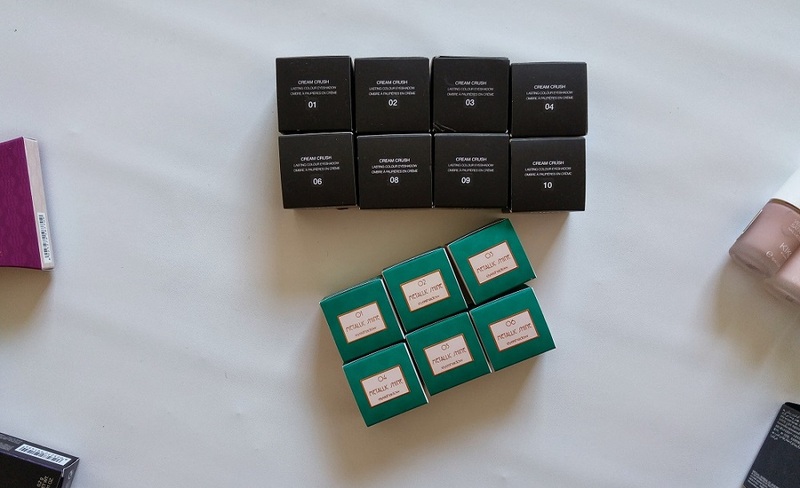 I have chosen 8 Cream Crush eyeshadows that I really appreciate in that they can be built up or used as a light layer of color on the eyelids. I have also bought all of the Metallic Shine eyeshadows I've been dying to try out for some time and I have to say that I love them even more than I do the Cream Crush eyeshadows ! 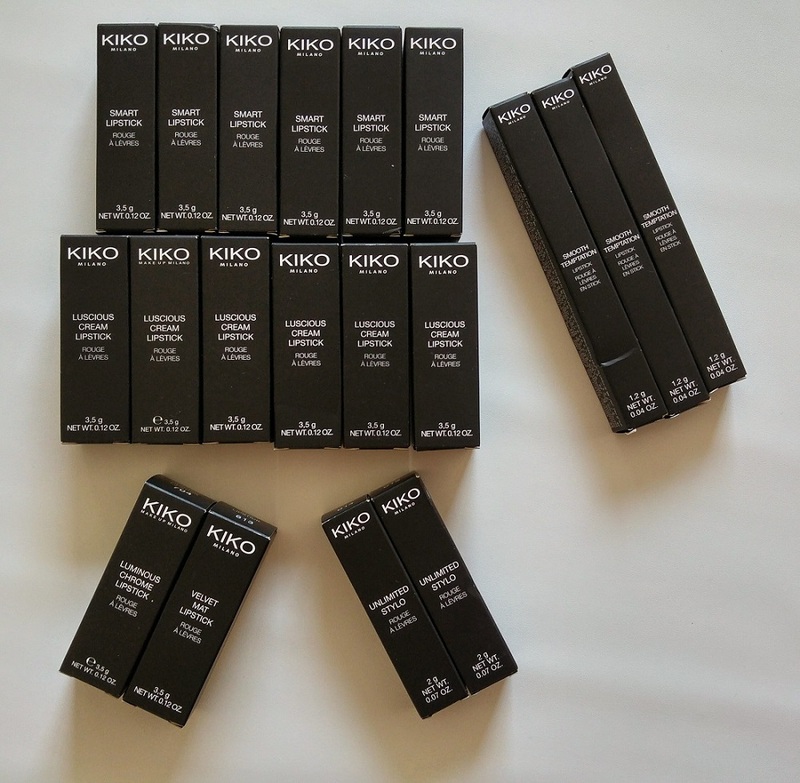 I've been hearing all kinds of good things about the Kiko Lipsticks so I really went crazy over them : I have chosen several Smart Lipsticks, three Smooth Temptation lipsticks as well as one Luminous Chrome Lipstick. Then, I have chosen a Velvet Matte lipstick in 613 Pink Carnation (you know how I was telling that I wanted the 612 Natural Rose) and several really beautiful Luscious Cream Lipsticks that I have bought for €3.40. And two Unlimited Stylo lipsticks ! I have gotten a brownish beige #14 and the #13 Cocoa I've been wanting for ages ! I have bought some face products too though I'm not used to that : I have bought two blushes from the Rebel Romantic Collection and two Soft Touch blushes I'll probably talk about soon. I have bought just one highlighter from the Cream Radiance range, it's like a small ball and is a wonderful golden white color. 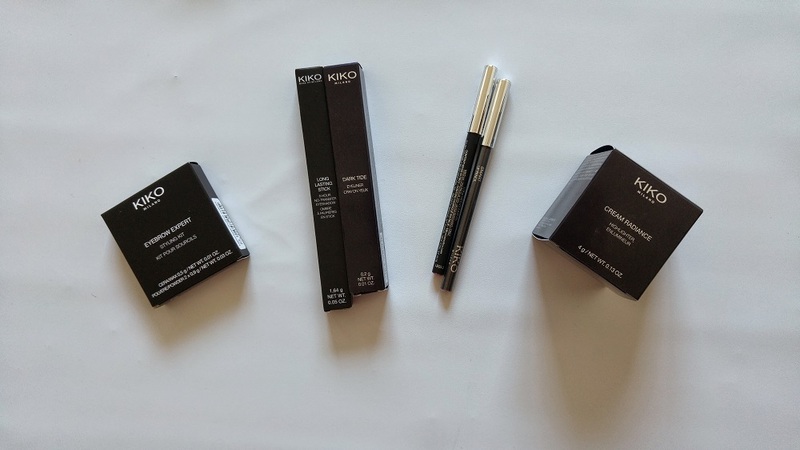 I have bought 5 Kiko eyeliners : three Liquide Intense eyeliners I've reviewed already, a Precision Eyeliner and a waterproof one I love ! Also, I've bought a wonderful rose gold Long Lasting Stick eyeshadow and a navy blue eyeliner pencil. I have 2 eyebrow kits but I wanted to try one from Kiko so I bought one for less than €10. 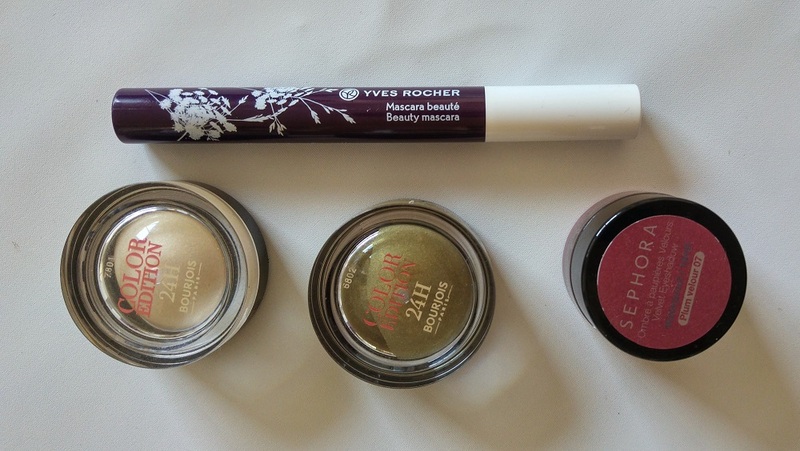 The last products for the lips I've bought are two lip pencils I love to use as lipsticks. The last things I purchased are 4 Velvet Satin nail polishes I really wanted to try. I really like the blue one and I expect to be writing about these before long ! So what have you bought during those winter sales ?